A very interesting question indeed. I posted this question on Twitter recently as I often ask guests on my podcast the same question and there are always many different answers. What makes Bitcoin so different is the way it works. The record of all Bitcoins sits on something called a ledger, that ledger records how much Bitcoin each person has and when they have sent it to another person. So for example, say Bob has 10 Bitcoins and Julie has 8 Bitcoins, if Bob sends Julie 2 Bitcoins the ledger will record this. Now you are probably thinking why do Bob and Julie not just use their bank accounts to do this, that works right? Well this is where it gets really interesting. Bitcoin is permissionless. What this means is that anyone can create a Bitcoin wallet and start sending and receiving Bitcoin unlike with a bank where you have to provide lots of information to open an account. Bitcoin is trustless. What this means is you can send Bitcoin to another person without relying on someone else. For example with the bank, you have to rely on them to complete a transfer. Bitcoin is immutable. Which means that once a transactions has been created it can’t be edited. Bitcoin is censorship resistant. What this means is that you can send Bitcoin to whoever you like without having the payment questioned and blocked. There are lots of other interesting features about Bitcoin, for example Bitcoin never turns off, so you can send Bitcoin to anyone in the world at any time of the day and it will be with them usually within an hour. The cost of sending Bitcoin is also very low, so no silly bank charges. Now I understand this is a lot to take in. Bitcoin is just a different way of holding and sending value where nobody can interfere. I don’t expect this all to click and make sense right away as Bitcoin is a fundamentally different way of considering money and value from what you are likely used to, but in time, if you keep learning it will start to make more and more sense. So how does Bitcoin achieve all this? This is where it can get very complicated. Bitcoin is known as decentralised, which means there is no single point of failure for the network. Remember the ledger I mentioned earlier? Well this appears on thousands of computers around the world in an identical format. There are lots of other concepts to discuss if you want to understand how it works but we can save this later for a more advanced lesson. For now, all you need to understand is that with Bitcoin you can join the network and send and receive Bitcoin without permission from anyone. If you are interested in Bitcoin you may have heard about other cryptocurrencies too. After Bitcoin lots of other ones have been created which do a number of different things. There are significant questions with regards to these other cryptocurrencies and they are risky investments. I will explain though. Many people have made lost of money by creating and investing in these other cryptocurrencies over specific timeframes and if you bought and sold at the right time you might too. They are very risk though as there are considerable questions over their long-term viability. The key feature which these other cryptocurrencies have taken from Bitcoin is the use of something called a Blockchain, which is part of the ledger we discussed previously. So for example, Bitcoin is a coin which exists on the Bitcoin blockchain, whereas something like OmiseGo exists on the Ethereum platform. The differences between coins and tokens are blurred as some tokens also operate like coins. Don't worry about this too much right now, if you find this confusing; this will become clearer as you start investing and researching the market. The critical thing to understand is that tokens exist on another platform and coins exist on their own blockchain. Okay Peter this is really complicated and I am totally lost. I understand this, for now let’s just stick with Bitcoin, if you choose to look into other cryptocurrencies then take your time and make sure you understand the risks. So What is a Blockchain? Bitcoin was this was the first true decentralised Cryptocurrency built using a blockchain. But what does decentralised mean? What is Bitcoin? And what is a blockchain? These are all essential topics to understand. Bitcoin was invented by a mysterious unknown person(s) called Satoshi Nakamoto. I will refer to them as a 'him', though there is no hard evidence as to whether they were a male, female or even a group of people. Before he invented Bitcoin, others had made many attempts to create digital money, but they all came up against a problem called double spending, whereby someone could fool the system by spending the money they had twice. Satoshi solved this by using something called the blockchain, a decentralised distributed ledger. What this means is, the record of all balances and amounts of Bitcoin spent are stored on an identical ledger (The Blockchain) across many computers (decentralised). With this he also created something called proof of work where computers known as miners would verify the ledger and be incentivised to do this honestly. Satoshi wrote a white paper explaining the concept of Bitcoin, which I do recommend you read at some point. Even if you don't understand all of it, it is an integral part of your education. I have gone back and read it a few times, and each time I understand it a little more. A good way to understand the blockchain is to compare it to a bank. A bank also has a ledger, which is where it keeps a record of how much money you have and it updates this ledger when you deposit or withdraw cash. When you send money to someone else, they deduct that money from your account in the ledger and the receiving bank adds it to the account of the person you are sending it to on their ledger. The bank, in this case, is known as a trusted third party, in that you trust and rely on the bank to manage your balance, activate your deposits and withdrawals, and keep your money safe. The blockchain is just a sequential set of blocks and each block is a batch of transactions. Every 10 minutes a new block is created which starts recording new transactions. Think of blocks as like pages in a ledger. Miners close blocks by competing to solve a complex problem, and the miner which solves the problem is rewarded with Bitcoin, currently 12.5. For the blockchain to keep building, each block is connected to the previous block, and each miner must maintain an identical copy else their blocks are rejected and thus they are unable to gain their block reward. As such, every miner is incentivised to keep the blockchain honest. The video below does a great job of explaining how the blockchain works and is maintained. Where do I Keep my Bitcoin? You keep your Bitcoin in something called a wallet (I will explain these later), and when you send Bitcoin to another wallet, this record is added to the latest block. Where this is different from a bank is that you do not rely on this trusted third party to manage your transactions, you do it yourself directly on the blockchain. Anyone can create a node and help maintain the network, yes even you. Though if you are new to Bitcoin, I wouldn't just yet, I haven't done this myself either, but I do plan to in the future. Trustless: which means there is no reliance on a central third party, nobody has to trust anybody else. Remember before, where we mentioned that with our bank accounts we rely on and trust the banks with our money? Censorship resistant: which means that anybody can send anybody any amount of Bitcoin without a transaction being altered or stopped. This can be compared to when Mastercard stopped people making donations to Wikileaks. Immutable: which means that previous records can never be changed. Fast: relative to certain forms of money transfer, Bitcoin is fast. We must though look at which types. If you want to send Bitcoin to another country, it is much quicker than using the bank to send cash. While a bank can take days, with Bitcoin, it can be as fast as 10 minutes. For debit and credit card payments, it is currently slower, when paying for a cup of coffee with your debit card, the payment is almost instant, with Bitcoin we are still tied to the 10-minute rule. That said, new technology has been created called The Lightning Network, which allows for fast payments, this though is new and still in testing. Cheap: again, this is relative to the type of payment, but the current average transaction fee is around $0.17, and this is irrespective of the size of the transaction. Therefore you could be sending $10 of Bitcoin or $10m. The Lightning Network is also working to reduce the fees associated with sending Bitcoin. The areas of speed and cost are quite complicated and also relate to the miners, those computers I mentioned before. We won't get into this now as it is a little more complicated than we need. All you need to know is that there are some inherent benefits of Bitcoin over traditional money. While some people originally thought that Bitcoin is anonymous, this is not entirely true, it is pseudonymous. If you create a wallet anonymously then yes, all transactions inside and outside of that wallet are essentially anonymous. If you interact with any exchange to either buy or sell Bitcoin for cash or spend Bitcoin with a retailer that collects your personal information, then that wallet address is no longer anonymous and all transactions associated with it are related to you. Okay, are you still with me? Let's look at why Bitcoin is important. As I mentioned previously, there are some broad reasons as to why Bitcoin is so important, I will though try and keep to the most significant ones and attach them to use cases. Confiscation, as experienced by the people of Cyprus during their banking crisis. A better store of wealth: Bitcoin is often compared to Gold, as a store of wealth. While gold has been an accepted store of wealth for individuals and governments for many years, Bitcoin has many advantages over it, primarily that it is easier to transport and easier to divide. Privacy: while I mentioned that Bitcoin is not truly anonymous, there are other cryptocurrencies which are, for example, Monero and ZCoin. These coins allow for users to transact with each other privately. Privacy coins are even more important when discussing the issue of fungibility, as some coins can become tainted. There are plenty of arguments for the benefit of other cryptocurrencies, for example raising money or the creation of tokens which allow you to use a service. I will discuss the risks and arguments against these later on in the course. If you want to learn more about why Bitcoin is so important, you might enjoy my podcast interview with Vijay Boyapati, The Bullish Case for Bitcoin below. Why am I Invested in Bitcoin? The reason I am invested in Bitcoin is that I believe this is a once in a lifetime opportunity to create a new form of money which benefits the whole world and with that wealth creation. I was too young to invest seriously in the dot-com boom, and this is might be my generations dot-com. I do though recognise there are some risks associated with Bitcoin, which I discuss later. We have a global economy, and with e-commerce, we can now buy from almost any country in the world. The growth in the airline industry has made it cheaper and easier to travel, and we are fast becoming a truly integrated planet. Using different currencies, relying on exchange rates and banks with their associated time and cost restrictions is starting to feel quite antiquated. Further, technology evolution is driving forward machine to machine payments, therefore I believe we need a global currency. I do not see how a centralised entity such as a single government or even an institution such as the World Bank can achieve this, politics will always get in the way. I feel that the only way a truly global currency can exist is to be decentralised, as we have with Bitcoin. While transactions volumes are still relatively low right now, I believe we will only see growth over the coming years, as such, I believe the current value of Bitcoin to be way below what it may become in 10 - 20 years. Those who predict a price of an individual Bitcoin to be over $100k or even $1m, do so on sound economic models. While we are still in the early days of figuring out how to use Bitcoin and make it available for everyone, a lot has been achieved in the last 10 years. I think the current state of the Bitcoin ecosystem is similar to the birth of the Internet. While the early use cases focused on e-commerce, some of the largest companies in the world are search engines and social networks, things which were not foreseen. As more money and talent enters the sector, I believe we are going to understand where the economic honeypots which Bitcoin enables. Ultimately I believe that Bitcoin as an investment will deliver a better return over the next 10-20 years than any other investment class, as such, it is the only class I have invested in. As I mentioned previously, please do not take this as financial advice, investing in Bitcoin is highly speculative and risky, you must do your own research. So you will have already seen me mention risk a few times in this module. It is extremely important that you take your time to understand the risks associated with investing in Bitcoin if you are seriously considering it as an opportunity for you. If you do decide to invest in Bitcoin, one of the first things you will discover is how volatile prices are. Look at the chart below; you will see that the price of Bitcoin grew from $1,000 to just under $20,000 and then back down to $6,000. Now you might be thinking why should you invest in something so risky, well that is a decision for you. My advice is that if you do you follow some simple rules. While Bitcoin has grown from close to $0.00 when it first launched to a peak of near $20k, it has fallen in price between 70-80% on six occasions. At some point it may reach a price and fall, never to get back there again. I have witness peopled eagerly invest in Bitcoin, understand that investments are long-term, only to panic and sell when the prices drop, losing lots of money. I even spoke to a stay at home Mum in New Zealand, who had been investing alongside her husband in lots of cryptocurrencies, and watched her portfolio fall from an initial $100k down to $20k. Invest for the long-term: if you believe in Bitcoin and believe in the long-term future growth in value, then you can buy at any price and hold for years. Learn to be a trader: this requires you to learn technical analysis, study the markets and understand how and when to enter a trade. Almost everyone should avoid this, it is hard, and most likely you have a day job and family you should be focusing your time on. Countless people have made money during a bull run, only to think they can become a pro trader and then lose money when the market turns. Trust me; I have done this. With time and patience and a dedication to learning and understanding the markets, I have become much more patient and comfortable with the volatility. This can only come with experience. There is no guarantee that investing in Bitcoin will make you money. There is a risk that it does not become adopted as a global store of value or medium of exchange, governments attempt to shut it down or that a fatal flaw is found in the code. My investment is a hedge, as such I do not have all my money in Bitcoin but an amount I am willing to lose. There has been a range of approaches from governments on how to tackle the issue of Bitcoin. It does present an inherent threat to traditional systems, whereby they can operate outside of government monetary policy. Further, there has often been accusations that Bitcoin is primarily used for illegal activities, and investments are also highly risky. We have seen the government of China outright ban all cryptocurrencies, though I expect a reversal at some point, to Japan and South Korea showing a very supportive stance. America has been mixed with its signalling to Bitcoin, usually dependent upon the departments who consider they have regulatory oversight and there have been contradictory stances at state and federal levels. Overall, America seems to be supporting the opportunity with Bitcoin, appearing to take the view that there is a wealth creation opportunity for its economy but wanting to ensure that investments, specifically cryptocurrencies which are a security, are within the current regulatory framework. The pro stance of the US and other nations appears to have pushed other nations to also adopt a pro stance; my suspicion is they do not want to be left behind. Smaller nations, specifically Malta, recognise the opportunity and are creating an environment which is highly supportive of the industry and are seeing many cryptocurrency companies relocate there. Still, markets can react violently to both regulations and even rumours, as such, you must be aware that this is a contributing factor to price and risk. There are ways to prepare for all of the above and mitigate the risk, and there are different levels of risk. Personally, I would never keep my Bitcoin in an online wallet or on my local computer. Further, I wouldn't store on an exchange such as Cryptopia on Coinbase. Anyway, we will discuss this in more detail later on, but you should be aware of the risk. I hope this as all been clear and helpful. 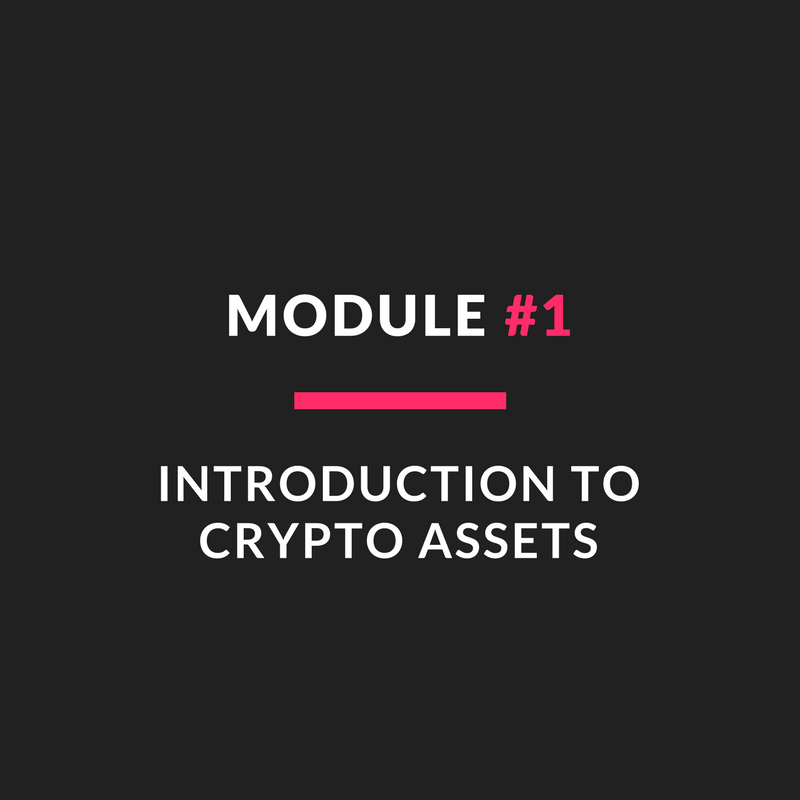 Now you understand more about Crypto Assets and how they work, you can now move onto Module #2 and learn some of the basic concepts related to Crypto Assets investing.